Experts since 1975, Reno Green Landscaping has proudly served communities across northern Nevada and California for more than four decades. What started as a small operation offering simple landscaping maintenance services has since grown into one of the region’s largest full-service landscape providers —all thanks to our loyal customers who use and recommend our services time and time again. Reno Green was founded on the belief that excellence in landscaping means approaching each and every project with sound horticultural practices, unparalleled customer service, and innovative landscape solutions. That tradition still holds true today—and is carried out by each of our dedicated team members as they serve homeowners, business owners, home builders, and property managers across our community. By carefully curating a team of the area’s most seasoned professionals, we’re able to offer our customers unparalleled landscaping experience—with concentrated expertise unique to our specific location. From the area’s microclimates to its diverse soil types, we know our locale—and its unique landscaping challenges—like no one else in the business, ultimately allowing us to provide knowledgeable recommendations and sound landscaping solutions that stand the test of time. 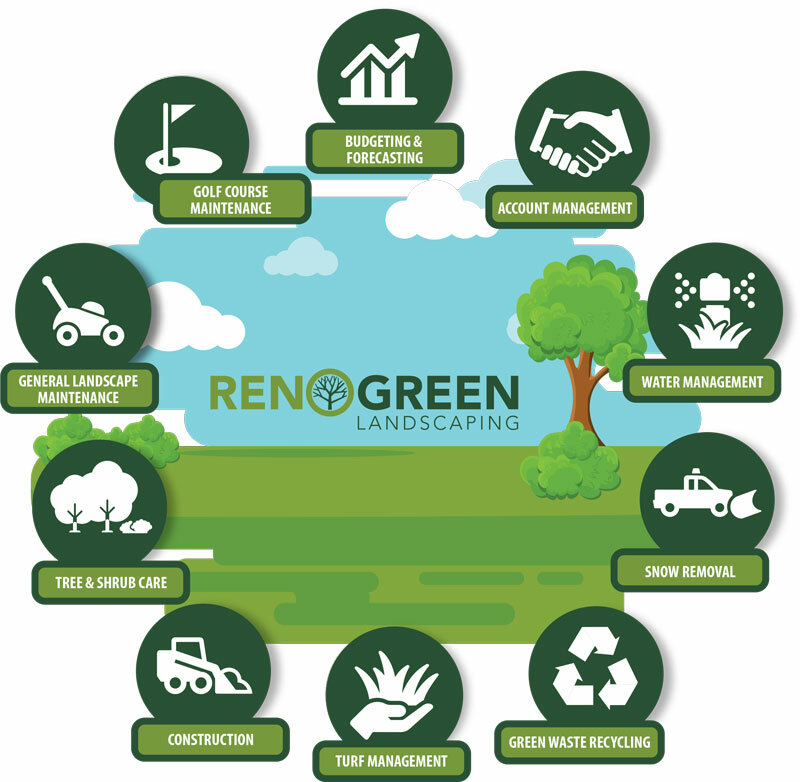 Reno Green Landscaping is committed to practicing sustainability in our everyday operations—allowing us to improve our area’s ecological health and ensure a bright (and green) future for generations to come. Because efficiency and eco-friendly go hand-in-hand. Choosing plants that are suitable for the climate and soil conditions, require less maintenance, use less water, and are more resistant to disease. Preserving our area’s natural resources is always a top priority at Reno Green Landscaping. We continuously research the latest in technology and work to implement eco-conscious practices into our maintenance and installation processes. Because stunning can also be sustainable. ENVIRONMENTAL STEWARDSHIP: Preservation with a purpose. We recycle all of our green waste, resulting in more than 10,000 cubic yards of material that’s strategically repurposed on to other properties—rather than going to a local landfill. Adds organic matter to the soil, making plant material more resistant to pests and diseases. WATER MANAGEMENT: Ensuring the well never runs dry. As landscapers, we’re acutely aware of the role that we play in preserving the area’s water supply for generations to come. Through strategic landscaping design, smart plant selection, and implementation of the industry’s latest technology, we’re able to preserve water and save you money—all while maintaining stunning landscaping. Bring ET (Evapotranspiration) Technology-or Smart Controllers—to commercial properties.